Forecast: Warm and dry – Welcome to Wyandotte Daily! The forecast for the weekend and through next Thursday will be warm and dry, according to the National Weather Service. The thermometer may reach highs in the mid 80s for most of next week, the weather service said. Temperatures may decline a little next Friday with a cool front moving into the area, according to the weather service. Today, skies will be mostly sunny with a high near 88 and a south wind of 5 to 8 mph, the weather service said. Tonight, it will be mostly clear, with a low of 69 and a southeast wind of 3 to 6 mph, according to the weather service. 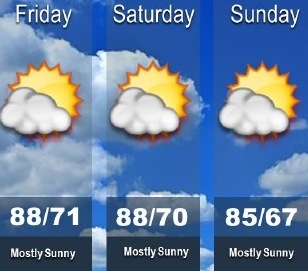 Saturday, it will be mostly sunny with a high near 88, and a southeast wind of 3 to 6 mph, the weather service said. Saturday night, it will be mostly clear with a low of 68 and an east southeast wind of 3 to 5 mph, according to the weather service. Sunday, it will be sunny with a high of 87 and a southeast wind of 3 to 6 mph, the weather service said. Sunday night, it will be mostly clear, with a low of 67, according to the weather service. Monday, it will be sunny with a high near 87, the weather service said. Monday night, it will be mostly clear, with a low of 69, according to the weather service. Tuesday, it will be sunny with a high near 88, the weather service said. Tuesday night, it will be partly cloudy with a low of 70, according to the weather service. Wednesday, it will be mostly sunny, with a high near 86, the weather service said. Wednesday night, it will be partly cloudy with a low of 71, according to the weather service. Thursday, it will be sunny with a high near 85, the weather service said.